Questions that cannot be answered. In these last ten years, science achieved great success. Those things which were impossible for us in the past. It's possible in the present. 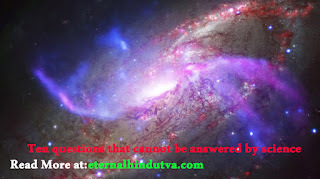 But there are too many questions science haven't these question answer yet. In this post I will explain ten questions there is no answer in science. Science doesn't think that God creates the world. According to science about 14 billion years ago, there was a fierce explosion which called the big bang. And science says the big bang created the universe. But why the explosion happened? And what existed before the big bang? Science doesn't know this question's answer. And how life started on the earth? This question is also confusing scientist. Quantum physics mysterious world is best for living life, and earth is fixes volume, Distance from sun fixed, its nature, its moon, it is like perfect. Likely god creates earth and universe. 2. What is the universe made of? Whatever we see in near. It's is made by atom. But Confusing things in the whole universe atom is only 5%. Left 95% what is that? We don't know. We know that in the universe made by two things dark matter and dark energy. in the case of dark matter, its work that attaches two or more galaxies. And dark energy is the cause of the universe expanding. Because dark matter and dark energy can't be seen, as well as can't detect by any technology. It's impossible to know what it is actually. We all know that in the black hole the gravitational force is very high so that even light can't reflect the black hole. for the last ten years,, we collected some information about the black hole. But still, we don't know what the bottom of a black hole is? According to Albert Einstein, the black hole is going to small by itself. the using black hole of we can travel to another the with less time. 4. How Does Consciousness work? The humans are energetic, and human can understand his near nature, events. Its called Consciousness and we are different from another animal. But we don't know about, where it is come from? And how they work? Our mind is to work as a central computer and manage every body's activities. We can find by our mind's scan that 100 billion neuron cells they complexly send and receive an electrical signal. And mind and consciousness aren't the same, Because electrical signal can't explain how the brain works as a consciousness, There are near death experiment, and out of body experiment proves that when brain stopped to work but consciousness still active. And What is Consciousness? Where its come from? We don't know. We know that when we dreaming in our brain nervous system send and receive an electrical signal. But We don't know why do we dream? According to one theory, to remove our stress, tension, tried that why dreaming. One theory believes that if our brain harddisk our dream is disk cleaning. Its means your unwanted information is erasing by your mind itself. There is too many theory, But no-one can tell with strong proves why do we dream? In this topic, peoples are divided in believes in ghost and no beliefs in ghost. There are too many videos, and photos are available for proves the existence of the ghost. But Scientist didn't get any strong evidence for proves that existence of the ghosts. Scientist and ghost hunter trying to collect evidence using electromagnetic field detector and thermal imaging technology. But their evidence isn't able to the existence of ghosts. According to the scientist, There is a brain disease, ocular vibration and in brain cause of electric signal. Its theory neither can be proved nor be disproved. Ghosts are still becoming mysterious for us. 7. How does the placebo effect Work? The fake treatment where the patient believes that he/she will be fine soon. Its increase the chances of his heals. Its called the placebo effect. When a scientist studies the patient's body and brain, those patients who believe that he will fine. Many patients are recovering from this technic. Humans are thinking about this question many thousand years. Ancient civilisations believed that by deeds, the soul goes to heaven or hell. Some religion believed that for re-birth. But now In the nearest time of death, science can know when the person will die. But scientists don't know what happens after death. It's also mysterious. Those people who see near-death experiment tell that they are going in the cave of light. Some of them, tell they are talking with their died relatives and god. But what is the reality? Scientists don't have the answer. 9. Why we have blood types? And its divide to two positive and negative.we know the antigens in blood didn't allow to work for other blood types. So that we need the same blood types. In modern science know too many information about blood, How its made? , what are works? , how it works? But we don't know why there are blood types of human. 10. How many species are there on earth? We are trying to live in Mars, But you would be surprised to know that we do not know about the Earth as much about this universe. Because In the 75% of the earth is only water. And we can't go to many places on this. So we don't know there any new species are there. When a scientist goes to any new places, they apparently find any new species. So There is no answer how many species are on earth. Thank you, I hope so you will like my article. If you know the answer to this question. With all due respect, You need a better translator.